Lindsey Joyce sits in the Director’s chair. The moment the ceiling of the empty dive bar gives way and transforms into a sea of stars – the moment Junebug and Johnny transform from hipsters on mopeds to celestial rockstars – the moment Junebug touches your soul with her voice – the moment you get to help create the song and to feel a part of the magic: that’s the moment everyone talks about in Kentucky Route Zero. That’s the moment the game’s identity crystallizes and you realize there’s something really special about it. Yet, there’s more to this moment than visual and aural aesthetic alongside well-crafted pathos. While these elements are deserving and interesting lenses through which to think about the game, what’s really at play here and what really crystallizes this moment is how the game deals with player choice and character development. 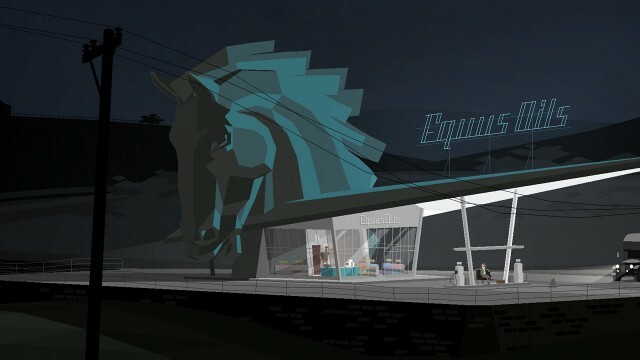 At first glance, Kentucky Route Zero seems fairly simplistic. It’s an episodic point-and-click adventure game with an ostensibly banal plot: Conway, a delivery truck driver in Kentucky, must deliver a package to an address he cannot find, but which he is told exists along the fabled Route Zero. Yet, despite this synopsis, it would be inaccurate to describe Conway as the game’s protagonist. He is central to the storyline, but far from the only focal character in the game. During their travels along this fantastical road, players rapidly switch perspectives between and occupy a multitude of characters, sometimes even simultaneously. This approach to narrative and ludic design, as well as the interfaces used to manage the drama and character development, situate the player not as a single actor on stage, but instead as the director of the play.In this way, the game has a complexity which hides beneath it’s vectored aesthetic. Positioned as director, the game requires your attention on several levels, since you try to understand both the characters you instruct and the narrative you orchestrate, as the story’s not-quite-omniscient narrator. On the one hand, you take on an over-the-shoulder perspective focused on character development and specificity, but on the other hand, there is the bird’s eye view of narrative totality, the question of how all the pieces you are building fit together on a larger scale. By elevating the player above a single-perspective experience, Kentucky Route Zero actually enriches its capacity for narrative agency. You aren’t confined to a single viewpoint through which to access and assess the narrative, but are, instead, present through all perspectives. You play as each of the characters both singularly and collectively, thinking of the importance a choice will have for a single character, as well as the impact it will have on other characters and the narrative whole. This is not only accomplished by the way dialogue is presented, but also through the lack of feedback systems and the lack of certainty about where any dialogue choice will lead. In Kentucky Route Zero, there is no feedback beyond the continuation of the dialogue, leaving you to guess where any particular dialogue choice will take the story next. In other words, the game requires you to negotiate each character’s development within and against an understanding of them you are simultaneously developing. While one limitation with this approach may be the ability to deeply connect with any single character, it necessitates critical thinking from a higher level order of story. Because you inhabit the brain space of more than one playable character, you can think on a level uncommon to single-perspective games. You think on the level of authorship rather than on the level of character. Given that most games allow players to inhabit only one narrative protagonist, the demands of character development generally rest more strongly in the hands of the game’s developers than with players. 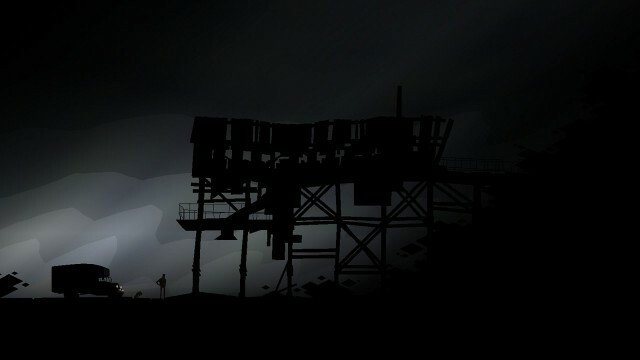 Kentucky Route Zero, however, puts character development more directly in the hands of the player. Of course, the game still dictates when you can switch between characters. For some stretches in time, you may only be presented with dialogue options for Conway or for Shannon, the miner’s daughter, and at other times, for both. When presented with the latter scenario, you must select which character speaks. In other words, you not only choose what will be said and by whom, but which character will be developed more deeply at the expense of the other. This navigation between characters adds complexity to the characters by allowing you to develop them at your own selection. While some players may seek to give Shannon more opportunities to talk, other players may choose to develop Conway more deeply; either choice affects the narrative and your understanding of it. Rather than being props for the narrative, all the characters are complex, at least potentially. They are waiting for you to realize their promise and flesh them out. Because you have built the characters up from both sides, not only are the character believable, but their dialogue carries meaningful emotional weight and complexity. While the options for character development are still, of course, scripted by the developers, the rich options provided to you have more depth than service level choices presented merely to propel the plot forward. Rather than reducing narrative branches to binaries such as “X responds with anger” or “X responds with sympathy,” Kentucky Route Zero presents more cryptic and nuanced choices, the result of which is the heightened capacity to project your understanding and interpretation onto the narrative itself. For instance, players are presented with several different ways to develop Shannon’s character, most of which offer different reflections on life growing up as a migrant worker in a mining town. When presented with the reason’s Shannon wasn’t able to have a dog as a child, you can select “My folks worked alternating shifts [in the mine] for a while” or “My dad was allergic.” Given the first choice, you will then be prompted to follow up with another statement from Shannon saying, “No time to care for a dog” or “And then they finally got their shifts in sync.” This interaction gives you narrative agency not only in your ability to make a choice, but in your liberty to interpret that choice as you will. Each selection you make realizes Shannon’s character in a different way. Shannon either becomes a child whose parent was allergic to animals, or a child whose parents were always working until – and this is only implied by the narrative – they were lost in a mine collapse. The design of Kentucky Route Zero and the way it invites you to interact and maintain agency through character development over story development necessitates critical reflection. You are less likely to act on a whim because of the level of responsibility the game affords you. You don’t make a choice because it’s “right” in some ethical or moral circumstance. You don’t make a choice in order to scale along a specific spectrum of good versus evil or in order to level up your capabilities. The choices in Kentucky Route Zero aren’t binary or rigid in that way. Its decisions aren’t about moral superiority, they are about what feels right within the context of the story you are writing. They are about the subtlety and nuance that eventually lead to deep and rich character development. They are about allowing players to author their own experience in the game. They are about narrative agency. Lindsey Joyce’s life goal is to get Hamlet on the Holodeck. In pursuit of that lofty end, she writes, edits, and works to finish her PhD in the field of interactive narrative systems. She is currently the Managing Editor for both Haywire and Five out of Ten Magazine. Her written work can be found at Critical-Distance, Kill Screen, First Person Scholar and on her personal blog TheJoycean. You can follow her on Twitter.